Let this elegant crystal baby carriage help you roll out the best baby shower ever! Each shimmering multi-faceted baby carriage measures about 2" long and is accented with silver embossed wheels and metal handle. 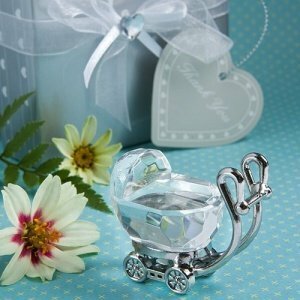 We nestle the carriage on satin inside a silver gift box with heart print. Then, we tie the gift box with an organza ribbon and matching heart shaped hang tag for a spectacular presentation.